Pizza Pie — NORTHERN DOUGH CO. When its chilly and grey (or any other time) a perfect pie is the very best comfort food, and you can make your own mini single-serve versions, with all the autumn flavours, using our recipe below (we’ve used lots of bits from other recipes, it’s a great way to love your leftovers!). Simply switch ingredients to suit your taste, anything goes! Pre-heat your oven to its hottest setting, and lightly flour your worksurface and rolling pin (if using). Roll or stretch your dough to approx. 10-12 inches, keeping it more square than round, if you can. You’ll also need two 5inch (approx.) ramekins, or small, oven proof bowls, lined with baking paper. Cut your dough in half. then from each half, cut a piece of dough approx. 1/3 the size, so you have unequal sized pieces. Use the larger piece to carefully line your ramekin or bowl (ensuring it has first been lined with baking paper). You’ll need to push it inside gently, to prevent any tearing (but don’t worry if it does, simply reposition and fill any gaps with excess dough that is hanging over the edges). Layer your ingredients, using half a tablespoon at a time, so you have two layers of each, inside the dough, until you have filled it to the top. Take the remaining dough, and lay it across the top, so you have a pie lid. 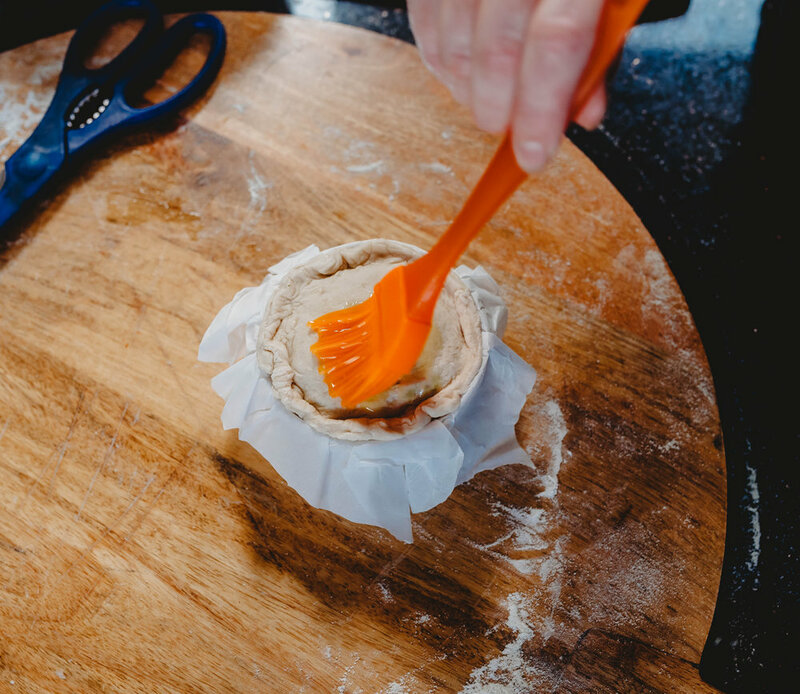 Pinch the edges of the base dough and lid together to form a tight seal, and trim off the excess, leaving a lip that can be crimped together to create some nice detail on the top of your pie. Cut a little steam hole with a knife. Glaze with a beaten egg, then bake for 8-10 mins until the dough is golden brown, then use the baking paper to carefully lift it out of the ramekin. Remove from the oven and leave to cool for 3-5 mins. Slice and enjoy!